The red dogwood (Cornus sericea) is named for its red twigs and for the color of the leaves, which turn a deep burgundy in the fall. Also called the redosier dogwood or the redtwig dogwood, this tree, which grows on multiple trunks, is desirable for its small stature and winter interest. 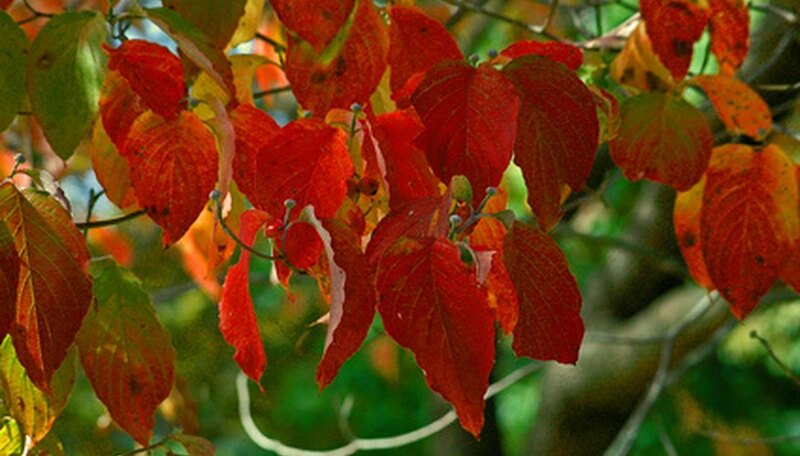 The red dogwood enjoys temperate climates, with mildly warm summers and cool or cold winters. This tree grows best in USDA zones 2 through 7, according to North Carolina State University, and will not fare well in hot tropical or subtropical climates. Red dogwoods are shrublike. They grow on multiple trunks and reach a maximum height of around 15 feet, according to Virginia Tech University, although the average height is even shorter than that. The width of these trees usually equals or surpasses their height. The bark and twigs are a deep red color, which provides outstanding winter interest. The leaves are ovate and green in the summer, turning purple-red in the autumn. The flowers, which bloom in the spring, are small, flat and white. Red dogwoods are easy to grow and are adaptable to most types of soils, according to the University of Connecticut. They grow best in full sun to partial shade, and prefer continually moist conditions. Prune these trees back severely in late winter or early spring to get the most vibrant twig color. Red dogwoods can suffer from a number of mild fungal diseases. While these problems do not usually pose a threat to these hardy trees, they can be unattractive. Scale insects can cover the twigs with their white, waxy bodies. Spray the tree with an insecticide to get rid of infestations. Apply according to the instructions on the package for the size of your plant. Leaf spot and cankers can form on the leaves and branches. Both are caused by fungi. Prune away affected areas, and make sure to clean up any dropped leaves so that the fungus does not overwinter in the soil. Spray the tree with a preventative fungicide in the spring to ward off these diseases. "Baileyi" is a cultivar desirable for its bright-red stem color and purple fall leaves. It is also one of the few cultivars that does not spread underground, which makes it non-invasive. "Winter Flame" has stems that range in color from red to yellow and bright orange all on the same plant. "Silver and Gold" has unusual, bright-yellow stems instead of red, and variegated leaves with whitish-gold margins.